Rogers Family Company, a gourmet coffee and tea company based out of California, has taken the initiative to help our animal friends, the jaguars. Using their responsibly grown coffee rightfully named, "Rare Find Panthera Blend," the Rogers' Family Company donates 20 percent of each online sale and 10 percent of each distributor sale to Panthera-Leaders in Wildlife Conservation. The organization is dedicated to help save the world's endangered wild cats. The Rogers' Family Company president, Jon Rogers had this to say, "We are honored to work with Panthera to preserve the jaguar - which is one of nature's treasures and one of the great symbols of the wild– for future generations." Jon goes on to say, ""We hope that Rare Find coffee can make a meaningful contribution to the effort to save jaguars in coffee growing regions where we've seen firsthand how our industry can play an important role in preserving nature." Rare Find coffee beans are organically grown in the Concordia area of Colombia and Chiapas Highlands, a mountainous region in the southeastern part of Mexico. If you are wondering why these are the chosen locations to grow the beans for this unique blend, the answer is simple. 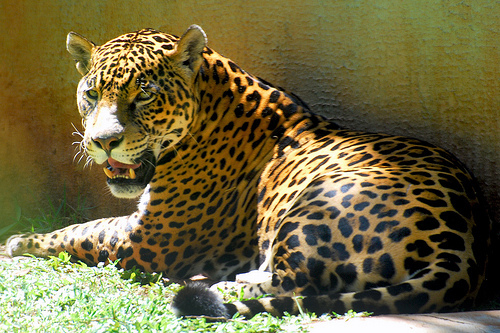 These regions are the natural habitats of the jaguar family. Now it's all starting to make sense, isn't it? So what's the cost for Rare Find? A 12-ounce bag of whole beans retails for $11.99, while a 2-pound bag is $22.99. If you would like your coffee ground before it arrives on your doorstep, it costs just 50 cents extra. As for the name, well Panthera and Rogers' Family Company decided on Rare Find after conducting a nationwide naming contest. Click here to order a bag of this certified organic roast. Baltimore, MD After suffering with health issues for two years, Laeticia became a vegan and was able to go from barely walking to running 5Ks. She became well aware of the cruelty to animals through research during her life change. In doing so, Laeticia discovered a newfound love and respect for animals and works hard to teach her son why we don't eat them. She is currently training for her first half marathon. One of Laeticia's goals as a writer and blogger is to help motivate others to living a healthier lifestyle through a healthy diet and fitness.